oh, sweet joy! 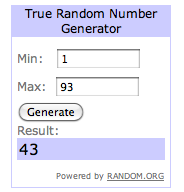 : winner + another giveaway! Ms. Megan at Moonbeam Wishes! If you didn't win this one, I have another fun giveaway for you!! Do you need a blog makeover? Yessssss? Well you're in luck! Dana, with Designs by Dana ((who recently reformatted my blog)), is offering one of you sweet readers a FREE "Simple" Blog Design Package. WHOA! This includes a "simple" banner, a background, AND a blog button. You can click here to see some of Dana's work that she has done in the past. Leave a comment telling me why you need/want a new blog design. 1. Follow both @ohsweetjoy & @danasearsfam on twitter. "Need a new blog design? Enter the blog design giveaway on @ohsweetjoy's blog from @danasearsfam! www.yellowsongbird.blogspot.com"
3. Become a follower of Yellow Songbird via Google Friend Connect. I can't wait to see who wins this & the design that Dana works up for you! I was just thinking about working on my design. It's been a daunting task to think about DIYing. This would be an awesome gift! I need this so bad since I am new to the blogging world and know very little. What a great prize!! I think I will be turning my blog into a place I can update about my kids for family and friends, so I need a different look! I think I need a new blog for the upcoming Etsy shop! I am always trying something new with my blog and it would be SO nice to have a professional's help!! I tweeted about this wonderful giveaway!!! I of course follow your lovely blog!!!!!! My blog is stagnating and I know ZERO about web design. It would be great to have a new perspective! I've actually been contemplating a new design, so this is perfect timing! id love a new blog designs cuz there is some HTML i can not figure out. so it'd be great for some help! i follow yellow song bird. woohoo! i need one because i try to do it myself and bad things happen! i am a follower of yellow songbird as well. I need one because i don't know how to do anything for my blog! I would love some little extras to go with my new design and would love, love, love to have Dana do it for me! PLus, she's an awesome mom! I'd LOVE a blog makeover because I know nothing about HTML and would greatly benefit from someone else taking over the reigns in that category!! I follow you and Dana on twitter! Oh Kim! I apologize now as I am catching up on blog reading and will likely be commenting on your last 7-8 posts! Tee hee! Thanks again for participating in my giveaway - it really meant a lot to me! i'd love a blog makeover as im gaining followers but don't really know much about design. I need one. I badly need one for my written by mys blog it is pr2 and it is wearing a generic template. I need a blog redesign because my blog is new and I don't even have a banner yet! my graphic skills are terrible and my blog suffers for it :) haha, I would love a blog makeover! Megan is such a fantastic person! Her blog is fabulous! She is such a great person to win this giveaway! I've never had a professional blog design before. I have no idea how to do graphics or computer design. I would adore this opportunity to take my blog one step further! I need an update b/c I've never had an update and I can't figure out how to make a button! Oh my, I can't even begin to list the reasons, I need a blog makeover...I would absolutely LOVE it! I have been wanting to get my blog up and going for my DIY ideas and Etsy shop! This would be a wonderful blessing! dude, i not just want but NEED a blog makeover. my HTML skills are lacking big time! i just moved & want to get a fresh start with my business....which stars with my blog! it is in serious need of some makeover goodness! and last but not least i follow you with good old GFC! I would love a new blog design for my blog that honors our Angel Baby - my miscarriage at 8 weeks. Ohhhhhh I would love a little blog update. Actually, I'd love a Twitter background update even more. And goodness knows you can never have too many widgets! ...and of course I follow this awesome blog due to it's awesomeness.